Like many ACUPCC signatories, GW has committed to carbon neutrality and has created a climate action plan outlining carbon reduction strategies. But climate is not the only risk universities must manage and mitigate. 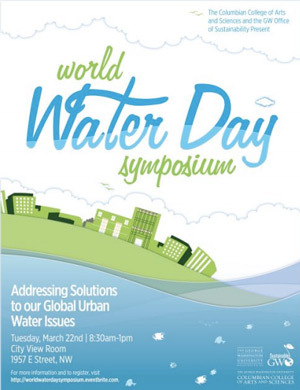 By 2030, demand for water globally is projected to exceed supply by 40 percent. Climate change has a number of implications on the water cycle, creating disruptions in water supply worldwide. Higher-education institutions have the unique opportunity to not only integrate sustainability into their operational practices, but also into their academic and curricular programs. GW has committed to writing three strategies to reduce our resource system impacts: aclimate action plan, a water action plan and an ecosystem enhancement plan. While these three issues are cross-cutting and interconnected, GW chose to set strategies focused on each resource impact area individually to set discrete targets, goals and indicators for reduction and enhancement. Across the United States and globally, the most pressing water issues vary. In Washington, D.C. the stormwater runoff and quality are the primary focus. As an institutional citizen in the D.C. metro area, GW has a responsibility to help protect our local watersheds and to serve as a steward of one of the region’s most precious resources. The GWater Plan is a comprehensive plan for water sustainability at the university, and is a model for others in the watershed. The GW Office of Sustainability developed a planning process for the GWater Plan modeled on the process used for GW’s climate action plan focusing on solid research and robust stakeholder engagement. The process began with a benchmark of private, government and non-profit sectors to understand best-practices in water sustainability. While the corporate sector has begun to disclose their water impacts, their data is primarily centered on water-use in manufacturing processes, not particularly applicable to the university-sector. Other higher-education institutions are focusing on water, but primarily on reducing potable water usage. GW is one of the first institutions to pull together a comprehensive plan for water sustainability that addresses four areas of a comprehensive footprint: potable water, rainfall capture, wastewater and bottled water. There certainly is room for debate over whether these four focus areas represent the only factors of a footprint. For example, some may argue that bottled water belongs in a waste-reduction/ecosystem strategy. However, overall, these four areas allow GW to address the most material issues for its campus: reduce the quantity of water consumed, increase the amount of rainwater capture from the campus, enhance the quality of water sent down the storm system and encourage the GW community to reclaim tap water and reduce bottled water consumption. Once the focus areas were selected the key was figuring out how to set measurable targets and goals for each area. The Office of Sustainability worked closely with internal stakeholders such as facilities, housing, athletics, student services, campus planning and risk management to gather the relevant data. Another important step was engaging the faculty; the GW Office of Sustainability helped to secure a grant through local water municipality in the District of Columbia for a faculty member to conduct research on stormwater infrastructure. Student engagement was also a key component to develop the plan, particularly around the areas of potable water and bottled water reduction. When the Office of Sustainability gathered data to help set the potable water reduction target, this proved to be the most difficult activity. GW wanted to pick targets that were realistic based on known infrastructure improvements. Using a model of water consumption created a few years ago by a university consultant, the Office of Sustainability experimented with different reduction scenarios. The rainfall capture target was drafted according to known green roof projects slated as part of new construction. The targets for wastewater and bottled water are more qualitative as measurement in these areas is difficult and hard to track at this time. A crucial component and theme of the plan is that it is a living document and will be updated as new technologies, measurement techniques, regulations or other factors come into play. One of the key challenges in the process is that there is currently less of a financial case for implementing water reduction projects than there is for alternative energy and energy efficiency projects. The utility price of water is relatively low. From a risk mitigation standpoint though, stormwater fees and rate payer fees for water are only expected to rise. Additionally, increasing water scarcity will be a pressing issue for our community to manage in the future. In sum, while the business case for water projects is less clear than that for energy savings project, institutions like GW will benefit from taking a longer, more holistic view of available resources and work now to prepare campuses for adapting to a water-scarce world. For more information and to read the GWater plan please visit gwu.edu/GWater_Plan.pdf.